I get this question a lot so I thought I would make a quick tutorial. Wearing multiple tattoos is really simple, but you’ll have to use a viewer that has this feature enabled. I am using the latest SL 2.30 Beta viewer, so the tutorial is for this viewer only and not older viewers or any other Third Party viewer. 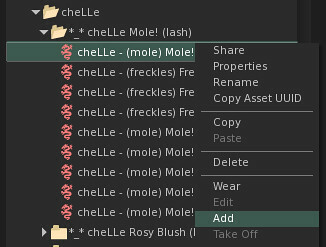 When you click the little SHIRT (My Appearance) icon, and go to Wearing tab, you should see all the tattoo layers you’re wearing listed there, and right click “take off” to remove any layer. Helpful tip: Tattoo layers are shown in the order that they’re worn. For example, I typically wear Eyeshadow -> then eyeliner -> then lashes. If you do it the other way around, lashes may be hidden under the eyeshadow layer and it won’t look as nice. If something doesn’t show up as well, just remove it and wear it again so it sits on top the other layers. I want to add that the add option also works with every other clothing layer and prim attachments!! Wow! You should a tutorial about inventory organizing *laugh*! Also if you put things on in the wrong order, you can just hit the edit outfit button in the wearing tab, and move the layers up and down. Sometimes your appearance will end up weird as you teleport around when you do the layer changing stuff, but for the most part it’s preferable to pulling things on and off. Oh I didn’t know that, great feature. Thanks for sharing. I never knew it worked like this! Thank you GoGo, you are such a wealth of knowledge 🙂 This gives me incentive to try the LL viewer again. Is there an easy way to SAVE the layer order as an outfit in My Outfits? I have not had much success with this. Thanks! Unfortunately this doesn’t work as of the date I’m posting this. I’m using Phoenix 1.5.2.908 and I don’t get the option to ADD for any of my 2.0 tats. Sad. I have that option as far as I know on MY phoenix..
Abrah, i don’t either that’s why i’d like to know if it is possible to link the layers. i switched from Phoenix 1.52(908) to Viewer 2, added the layers, which was great! but when i switched back to Phoenix i could only see my first layer – not sure if those using Viewer 2 could see all my layers. its a shame coz i prefer Phoenix. but now use Viewer 2 just because i can customise my av’s appearance better. and not sure if those using Phoenix can see all my layers anyway?! also, i know it is possible to link the layers – do u know how? OH MY GAWWWWWWWD I had no idea we could do this and I just stumbled across this post MORE THAN A YEAR after you posted it! LOL! Thank you! MY SLIFE IS CHANGED! !